Carrying a number of superstars, Tale of Us, Red Axes, a boss from the top label “Life and Death”, DJ Tennis appears at DISKO KLUBB. 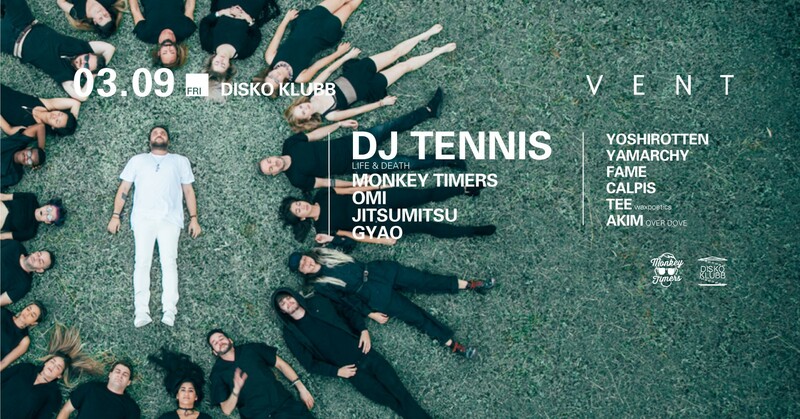 Best act of 2017, DJ Tennis will come back at VENT for the sensational party “DISKO KLUBB” presented by brightest hope MONKEY TIMERS!! Producer, A&R, chef and restaurant owner, having a lot of faces, DJ Tennis is definitely one of the heterodoxy talents of the world. This multi-talented artist will bring you left field experience. “Life and Death” is a label founded and led by DJ Tennis and has been releasing artists like Tale of Us, Mind Against, Recondite, Red Axe, Maceo Plex. With his polished sense and technique, this label certainly got under the skin of European’s music scene. DJ Tennis has been in a music scene for more than two decades, his DJ skill which brings people together even at the vast field is something very unique. We all know his play last year was one of the best sets at VENT, those who experienced last year and those who didn’t, this is a huge chance to witness this wonderful night!! !